Livie Cleary was always the smart, sensible sister and her sister Kacey was the wild one. But deep down she is desperate to make her parents proud even though they are no longer alive to witness it. She follows her father’s dream for her, going off to Princeton to pursue a career in oncology. But when her sister and her roommate drag her to a party one night, she didn’t expect to get drunk and become infatuated with the best looking guy on campus. Suddenly there is more to life than the future she had mapped out for herself, and she finds herself constantly drawn to a guy who is exactly the opposite of the man she always expected she would marry. I really liked Livie’s story, and I think I liked it even better than Kacey’s. Livie has always seemed put together on the outside but she actually is still dealing with her parents’ death on the inside. While she has a very different way of dealing it from her sister, it still is not healthy. She is so desperate to fulfill her father’s dream of her going to medical school that she doesn’t even stop to think about what she really wants. When she meets Ashton, she realizes that the life she planned for herself may not be the life she actually wants to live. I was really able to feel Livie’s conflict and I felt myself going back and forth with my opinion of Ashton right along with her. He comes off as a player and someone who could never get serious with someone like Livie, yet when they are alone he acts like she is the only person he cares for. Half the time he acts like a sweet, caring person and the other half he is being a jerk so, like Livie, I went back and forth between loving him and hating him. What Livie comes to discover though, is that there is more going on in his life than she realized and he may be dealing with just as many things as she is. Overall, One Tiny Lie was a great story about a girl’s struggle to discover herself. I really loved this one and I liked the fact that Kacey and Trent still made an appearance. 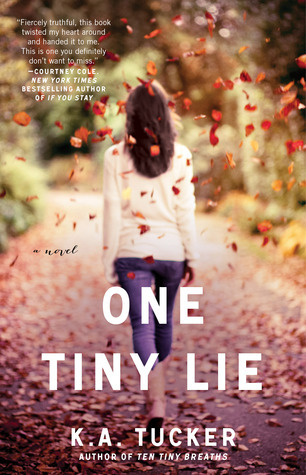 One Tiny Lie was released on June 11, 2013 and is the second book in the Ten Tiny Breaths series.